How do you visually define "happily ever after"? 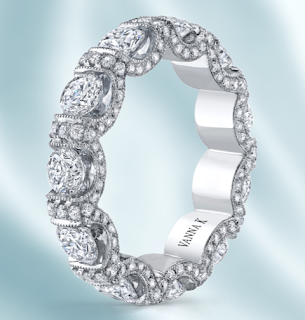 This ring by Vanna K could be the start. This ring could either be worn as a wedding band to mark where you are going or as a gorgeous right-hand ring to mark where you are now. This creation by Vanna K is truly set apart.Most diamond bands are plain, simple, under-stated. But this ring is truly as unique as your love, and one of the most dazzling diamond bands on the market today. The intricate design uses tension-set large round diamonds to first catch your gaze. Then, unique micro pave setting skills are used to detail the sides with round diamonds for a stunning and distinctly gorgeous look. With over 4 carats total weight VS Quality Diamonds, the one thing this ring delivers is pure, uninhibited dazzle. On top of that, it is a Comfort Fit Design, which makes it easy to wear all day, every day. Find this and other amazingly unique diamond rings today at Vanna K.